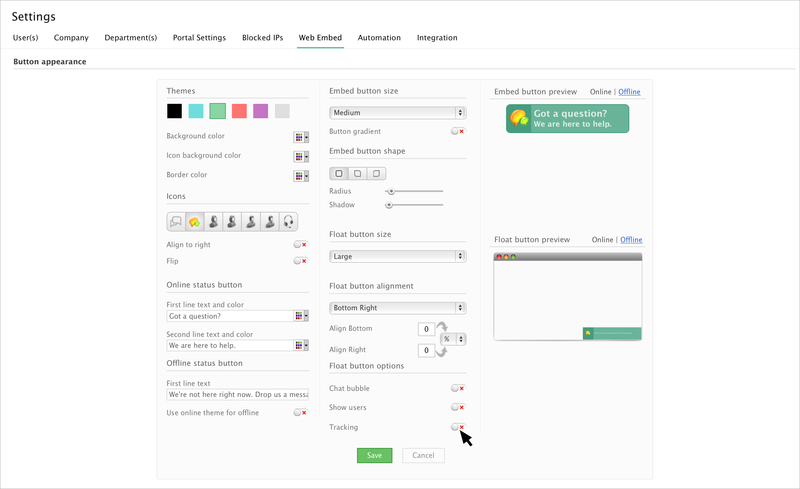 You can personalize the sound setting for tracking, when a visitor visits the website and leaves out. From the drop-down menu click "Personalize". The "Personalize" window will pop up. Choose the "Sounds tab" followed by the "Visitor events". The last two in the visitor events will customize the tracking sound events. By clicking on the drop-down menu to the right of event name, allows you to choose from different sound options or choose "None" if you wish, not to have a sound notification for that particular event. Each time you make a change by clicking the name of that particular sound the system automatically saves it to your new choice. Once you have chosen which sounds you want for each event, simply click the X symbol at the top right to return to the Zoho SalesIQ operator console window. The Tracking reports section in the Reports module, is a robust dashboard that gives you a feel about everything in the entire live chat tracking operations. You can enter the Tracking Reports module, by clicking “Reports tab” on the left side of your agent operator console followed by a click on the “Tracking” tab. The tracking summary line graph displays the overall summary about the visitor tracking in your website. Visits - Count on total visit in the website. Contacted - Count on number of proactive triggers initiated by the agents. Responded - Count on chats replied by the visitor on proactive chat triggers. Note: But you are not limited to viewing reports only for today, and it is easy to change the range of the report. 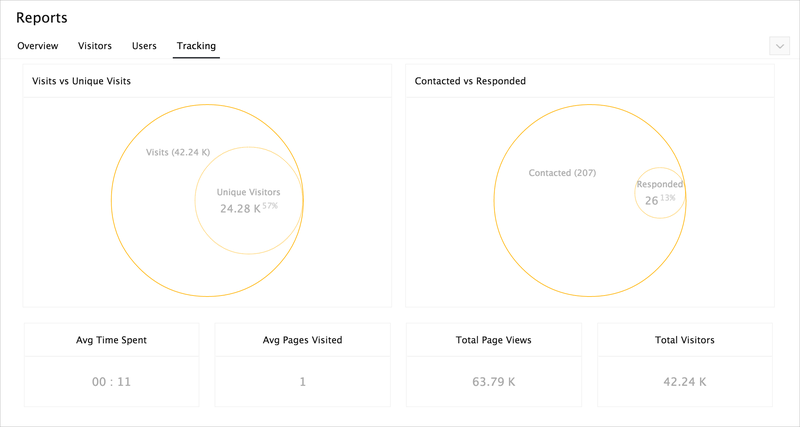 The tracking analysis report lets you view the average number of pages visited by a visitor and the average time spent by the visitor in a page. Page Visits - The average number of pages visited by a visitor. Average Time - The average time spent by the visitor in a page. In the final report section you can view the visitors website activity with the aggregate count. 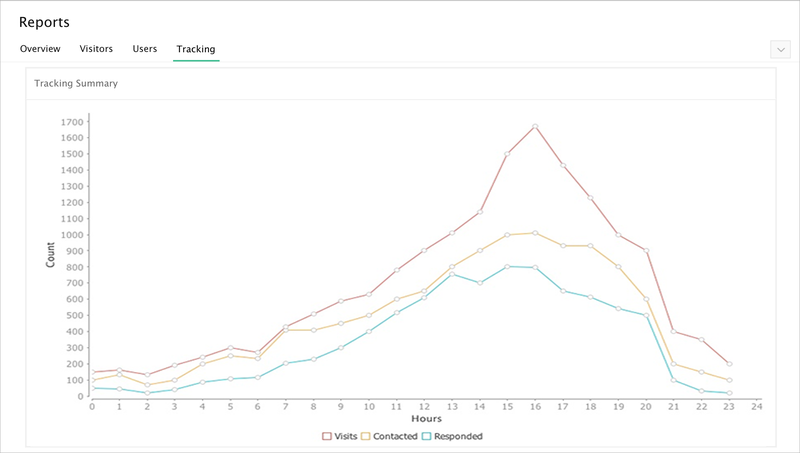 In this view, you can visualize your site visitor activity across the selected time frame. Visits - The total number of visits to your website during the set date range. Unique visitors – Unique visitors refers to the number of unique individuals that visited your website with the aggregate percentage. Contacted - Count on number of proactive triggers initiated by the agent. Responded - Count on chats replied by the visitor on proactive chat triggers with the aggregate percentage. Avg Time Spent - The average time spent by the visitors in your site. Avg Page Visited – Average number of pages visited by the visitors. Total Page Views – Count on total number of pages viewed. Total Visitor – Count on number of visitors. Tracking can be disabled in web embed settings. Follow the below steps to get your tracking disabled. In the Web Embed section, click on the name of the embed, which you would like to disable tracking. Go to "Button Appearance" section, click “Change the Appearance”. Disable “Tracking” and click “Save”. Note: The same can be followed to enable tracking. Tracking is available only in float chat widget.